Create a 6” x 6” white card base. 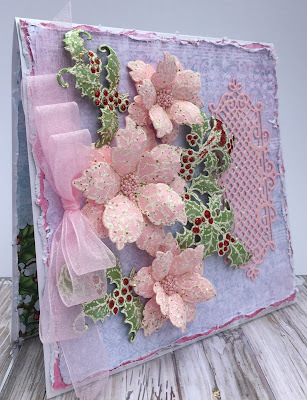 Cut pink paper from the Winter’s Eve Paper Collection 5 7/8” x 5 7/8” and distress the edges. Cut another lighter piece of designer paper 5 3/4” x 5 3/4” and distress the edges. Adhere together with Dries Clear Glue. Adhere to the card base using dimensional tape. Stamp the poinsettias on pink cardstock using VersaMark, heat emboss with Aged Ivory Embossing Powder and die cut using the matching dies. Shape using the Deluxe Flower Shaping Kit, adhere the petals together with Dries Clear Adhesive and add prills to the centers. Stamp the holly and cardinals on green pearl cardstock with VersaMark, heat emboss with Aged Ivory embossing powder, die cut using the matching dies and shape. Color the berries and the cardinal with stickles and let dry. 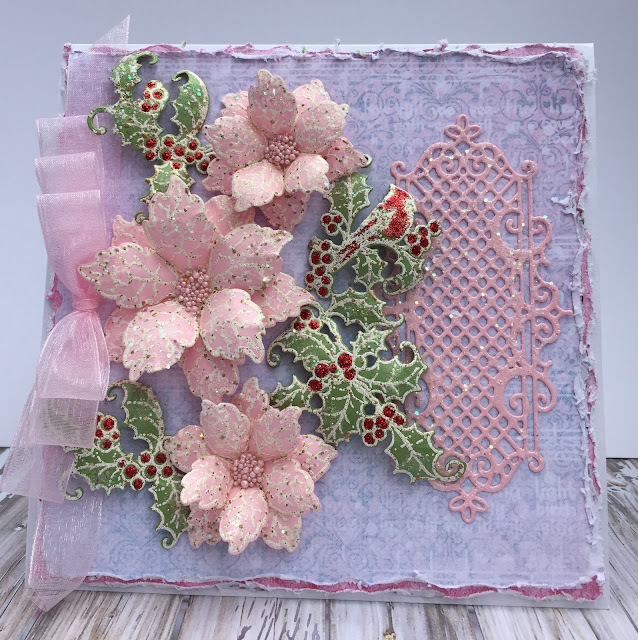 Using pink pearl cardstock, cut the decorative die from the Window Box Elements die set and adhere to the card base as shown with Dries Clear Adhesive. Adhere the Poinsettias and Holly to the card base as shown using hot glue gun. Using a sponge and Dries Clear Adhesive apply adhesive to the poinsettias, holly and decorative die and sprinkle with Rajni Chawla’s Crystal Clear. Make a triple layer bow and adhere to the side of the card. Maybe next week I won't do Christmas. Beautiful card! Love the soft colors!! Loving your card. Great minds do think alike and our cards are very similar. Of course I love yours! Beautiful card - love the pink sparkly poinsettias! Beautiful pink poinsettias!! beautiful card!